The 5160 Serial Digital Protection DA module is a fail-safe bypass protection switch for monitoring and switching critical digital paths. 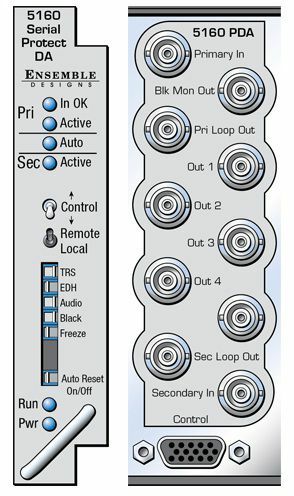 When a fault is detected in the Primary input, the switch will activate, causing the Secondary (backup) input to be switched to the module’s distributed outputs. The switch can operate in two modes; automatic or nonresetting. The 5160 monitors the integrity of the Primary serial digital input stream and analyzes the audio and video content. Signal health and fault detection is determined by monitoring any or all of the following parameters: Timing Reference Signal (TRS), Black, Embedded Audio, Error Detection and Handling (EDH), and Freeze. A sophisticated Black detection system is employed to activate the switch in the event signal is lost. It allows the user to select not only the threshold and percentage of nonblack pixels, but also the portion of the picture to be considered. The Freeze detection system can be set to detect a clean or noisy source. Freeze Time sets the number of seconds for the 5160 to switch to the secondary input after a video freeze condition is detected in the primary input.